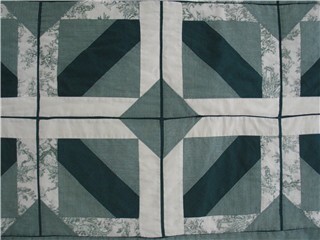 I have enjoyed looking at the posts others have had featuring their first quilts. Here is my contribution. It isn’t the first quilt that I started, but it is the first quilt that I finished! The date on it is 1995. I had two toddler boys and no sewing machine so I imagine that it took quite a while to finish by hand. Although they are nothing to brag about, I did design and draft the blocks myself. It is sparsely quilted, in the ditch. It has hung in our various family rooms or dining rooms for 10+ years now and was only last month replaced with a recent quilt. Everyone has to start somewhere, eh? Oh, get out of here! that is not a First Quilt! Wow, that is a really cool first quilt…and by HAND! I like the thin lines between the blocks…how did you do that…or is it the usual way and it looks so wonderful because the strips are so narrow??? Great, thanks for showing it to us!! This is so cool! And you did it by hand! I agree with Debra, that is too good to be a first quilt. 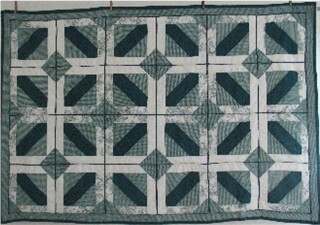 I agree–even if workmanship isn’t perfect, the fact that your first quilt was original is really impressive. Good colors too.